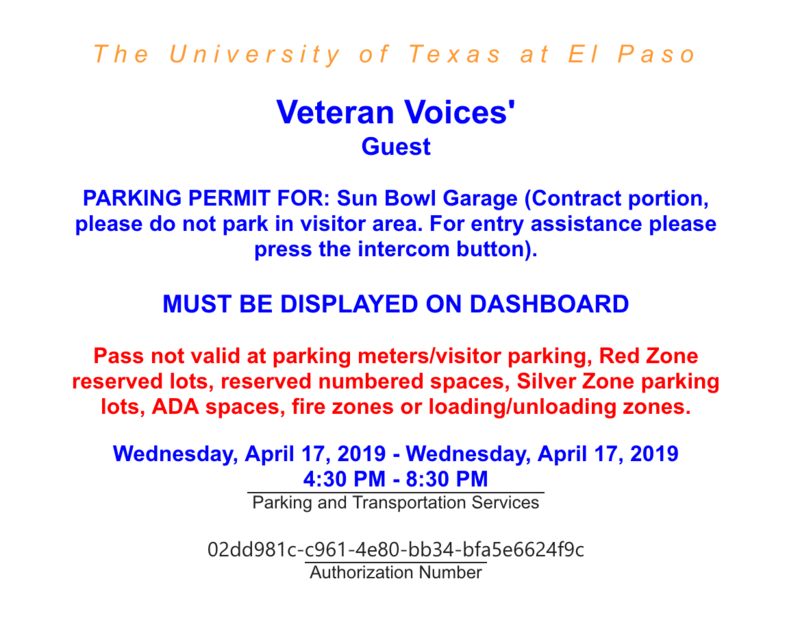 Veterans, their family and friends, and other interested civilians are cordially invited to participate in the upcoming Veterans’ Voices reading and discussion series at The University of Texas at El Paso. At each program, participants come together in small groups to read aloud from classic and contemporary literary texts about war, military service, and the return to civilian life. After the readings, participants engage in facilitated conversations that explore how the texts relate to their own experience and allow for shared reflection on combat and civic responsibility. Participants are welcome and encouraged to attend multiple sessions but are not required to do so. These events are free and open to the public. No preparation or prior knowledge of the material is required for participation. We ask attendees to RSVP at https://www.humanitiestexas.org/veterans simply to ensure that we can plan the program effectively. Free parking is available at the Sun Bowl Parking Garage. To take advantage of the free parking, you must print out and bring the attached parking pass. Please read the instructions closely. For more information, contact 512-440-1991 or programs@humanitiestexas.org. Veterans’ Voices is made possible with a Dialogues on the Experience of War grant from the National Endowment for the Humanities.